The International Space Station (ISS) is a permanent Earth-orbiting laboratory that will allow humans to perform long-term research in outer space. 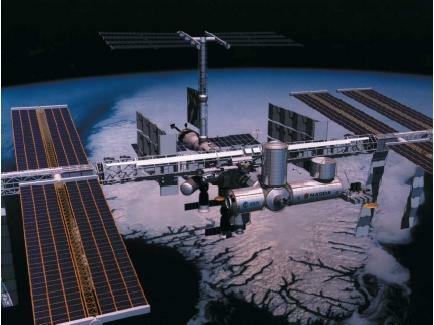 Led by the United States, the ISS draws upon the scientific and technological resources of sixteen nations. When completed in 2006, it will be the largest and most complex international scientific project in history. The International Space Station had its beginnings in the cold war rivalry (period of silent conflict and tension) that existed between the United States and the then Soviet Union (also called the U.S.S.R.) from the 1950s to the 1990s. Although the United States was the first to put a man on the Moon (1969), the Soviet Union came to specialize in and dominate the field of long-term human spaceflight. As early as 1971, they successfully launched the world's first orbiting space station ( Salyut 1 ) and continued nearly uninterrupted through the 1990s. Where the United States has placed only one space station in orbit ( Skylab in 1973) and sent only three crews of three astronauts to live there (none longer than eighty-four days), the Soviet Union gained valuable space station experience by regularly shuttling crews to its three generations of stations. One crew member remained in space for a 438-day tour. Around the mid-1980s, the United States decided to compete against and try to outdistance the Soviet Union in the space station field, since it felt that a long-term manned presence in space was what its military would need in the future. The United States invited other nations (except the Soviet Union) to participate on what it called Space Station Freedom. When the it collapsed and broke apart in 1991, the former Soviet Union (now called Russia) was eventually invited to join the effort. Since the Russian Space Agency faced severe financial problems (as did all of Russia after the break-up), it accepted help from the United States and eventually agreed to join and lend its vast experience to the creation of a truly international station in space. In 1993, the United States put forth a detailed long-range ISS plan that included substantial Russian participation as well as the involvement of fourteen other nations. Altogether sixteen countries—Belgium, Brazil, Canada, Denmark, France, Germany, Italy, Japan, the Netherlands, Norway, Russia, Spain, Sweden, Switzerland, the United Kingdom, and the United States—have banded together on a non-military effort so complex and expensive that no one nation could ever consider doing it alone. The program will involve more than 100,000 people in space agencies and contracting companies around the world. It is expected to cost at least $40 billion and take nearly a decade to complete. The ISS project has lofty goals. It is expected that having long-term, uninterrupted access to outer space will allow investigators to acquire large sets of data in weeks that would have taken years to obtain. The ISS project also plans to conduct medical and industrial experiments that it hopes will result in benefits to all humankind. meters) long, making it much wider than the length of a football field. This large scale means that it can provide 46,000 cubic feet (1,300 cubic meters) of pressurized living and working space for a crew of seven scientists and engineers. This amount of usable space is greater than the volume of the passenger cabin and cargo hold of a huge Boeing 747-400 aircraft. This massive structure will get its power from nearly an acre of solar panels spread out on four photovoltaic (pronounced foe-toe-vole-TAY-ik) modules. These solar arrays rotate to always face the Sun and can convert sunlight into electricity that can be stored in batteries. The station will have fifty-two computers controlling its many systems. The main components of the ISS are the Service Module, which is Russia's first contribution, and then six scientific laboratories (one American, one European Space Agency, one Japanese, and three Russian labs). The other major contributor is Canada, which is providing a 55-foot-long (16.7-meter-long) robotic arm for assembly and other maintenance tasks. The United States also has the responsibility for developing and ultimately operating all the major elements and systems aboard the station. More than forty space flights over five years will be required to deliver these and many other space station components to the orbiting altitude of 250 miles (402 kilometers) above Earth. The Russians placed the first major piece of the puzzle—the control module named Zarya—in orbit during November 1998. Following the launch of the American module named Unity during December of that year (which would serve as the connecting passageway between sections), the Russians launched their service module named Zvezda in July 2000. This not only provided life support systems to other elements but also served as early living quarters for the first crew. After more flights to deliver supplies and equipment, the American laboratory module named Destiny was docked with the station during February 2001. This state-of-the-art facility will be the centerpiece of the station. The aluminum lab is 28 feet (8.5 meters) long and 14 feet (4.3 meters) wide and will allow astronauts to work in a year-round shirtsleeve environment. Following the addition of a pressurized laboratory built by the European Space Agency, the robotic arm built by Canada, and a Japanese Experiment Module, the station will have many of its most important working components assembled. Since the main goal of the ISS is to conduct long-term scientific research in space, the crews naturally have a great deal of research to perform. Some examples of the type of research conducted are protein crystal studies. It is believed that since zero gravity allows more pure protein crystals to be grown in space than on Earth, analysis of these crystals may lead to the development of new drugs and a better understanding of the fundamental building blocks of life. Growing living cells in zero gravity is also a benefit since they are not distorted by gravity. Astronauts can therefore grow tissue cultures aboard the station that can be used to test new treatments for cancer without risking harm to patients. Astronauts will also be testing themselves and learning more about the effects of long-term exposure to reduced gravity on humans. Studying how muscles weaken and what changes occur in the heart, arteries, veins, and bones may not only lead to a better understanding of the body's systems, but might help us plan for future long-term human exploration of the solar system. Flames, fluids, and metals all act differently in zero gravity, and astronauts will be conducting research in what is called Materials Science to try to create better alloys. The nature of space itself will be studied by examining what happens to the exterior of a spacecraft over time. Also of great interest are the physics of forces that are difficult to study when they are subject to the gravity of Earth. New products will regularly be sought after, and there is hope that space may have real commercial potential that might lead to the creation of industry in space. Lastly, Earth itself will be watched and examined. Studying its forests, oceans, and mountains from space may lead us to better understand the large-scale, long-term changes that take place in our environment. We can also study how badly we are harming our planet with air and water pollution and by the cutting and burning of forests. The ISS will have four large windows designed just for looking at Earth. The assembly in space of such a huge station has begun a new era of hands-on work in space. More spacewalks than ever before will have to be conducted (about 850 hours will be required before the astronauts are finished). Already, Earth orbit has literally become a day-to-day construction site. Once completed, the ISS will be permanently crewed, and the crews will rotate during crew-exchange flights. The outgoing crew will "handover" the station to the incoming crew. During the first few years, emergencies that require crew evacuation will be handled by always having a Russian Soyuz return capsule onboard. Eventually this will be replaced by an X-38 Crew Return Vehicle that will look more like an airplane (as the space shuttle does) and will function as an all-purpose space pickup truck. Finally, despite the best of plans, there is always the possibility that the space station may not be fully completed due to any number of political, engineering, or financial reasons. Designers therefore have taken this into account and have planned the project so that it can still be fully used despite only limited completion. I think that this artical is amazing so i will use it 4 a reaserch! Thank You!